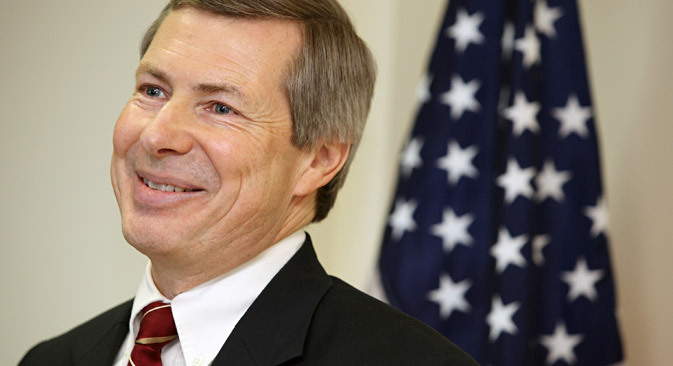 James Warlick, the U.S. co-chair of the OSCE Minsk Group for settling the conflict over Nagorno-Karabakh, has confirmed that an OSCE monitoring team came under fire recently while crossing from the unrecognized Nagorno-Karabakh republic (NKR) to Azerbaijan. "During our Line of Contact crossing, repeated gunfire forced @OSCE monitors to take cover. This is unacceptable," Warlick said on Twitter and Instagram. He also posted photos from the scene, without saying which side opened fire. The Nagorno-Karabakh foreign ministry press service had reported earlier that an OSCE team had monitored the line of contact between the unrecognized republic's and Azeri armed forces at a road section between Martakert and Tartar. The OSCE Minsk Group co-chairs took part in the monitoring mission under the leadership of OSCE Chairperson-in-Office's Personal Representative Andrzej Kasprzyk. "During the monitoring mission, the OSCE Minsk Group co-chairs and Andrzej Kasprzyk crossed from the NKR to Azerbaijan's territory. However, while the monitoring mission was being completed, shots from automatic weapons were recorded from the Azeri side," the Nagorno-Karabakh foreign ministry said. The Azeri Defense Ministry contended that it was the Armenian side that violated the ceasefire agreements during the OSCE monitoring mission. It said the fire was stopped after the OSCE Minsk Group co-chairs' intervention.